Throughout my school years, I always did some kind of dance. It started with ballet, then when I realised I didn't really have a traditional ballerina body, I tried all types: jazz, hip-hop, street latin, ballroom, pole dancing, you name it! In high school, I still danced, I sang first soprano in the school choir, I played clarinet in the band, and if there was a theatre production happening, you better believe I was going to be in it! I've performed on stage and I've worked as stage crew and I just love live stage shows - there is something about the atmosphere and energy of them! 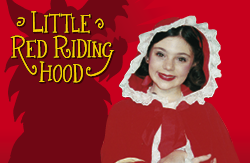 I was therefore super excited to be offered tickets to see the Fame Theatre Company's production of Little Red Riding Hood, showcasing the talents of the children who train there in performing arts and musical theatre. In the tradition of Fame school holiday productions, the show has a large cast of singers, dancers and actors as well as colourful stage sets, costumes, music and dancers. I have to say, I do have a soft spot for musical theatre, and I rather enjoyed the performance. There was humour pitched at the adults of the audience, and plenty of songs and dancing pitched at the younger members. There were plenty of pop culture references, and lots of repetition so that children could become familiar with songs and enjoy taking part in the toe tapping. My toddler companion was mesmerised and was clapping with lots of enthusiasm by the end. The big bad wolf and his weasel companion were one of the show highlights for me, although I was so impressed with the standard of all performers. I was particularly excited to see that there were two volunteer AUSLAN translators on stage, and thought they did a marvellous job interpreting. Perfectly timed to run during the June/July school holidays, Little Red Riding Hood is showing at the Brisbane Multicultural Arts Centre, 102 Main St, Kangaroo Point from 30th June to 4 July. Performances are at 10am and 1pm daily, and tickets are $18. Disclaimer: I attended the show as a guest of Fame Theatre. All opinions expressed are my own. I do love a good musical too. I think Wicked is probably my favourite out of all of the ones I've seen! Oooh! Now I'm wondering what my favourite would be. I love Avenue Q for the humour... and Phantom is a classic... and Les Mis is just fabulous... and Wicked always makes me cry. So hard to choose!